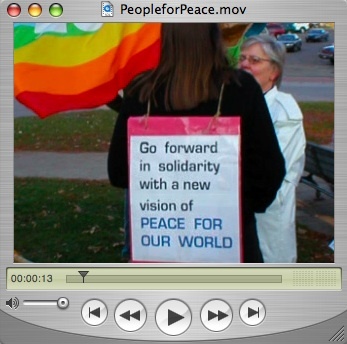 September 11 marks the five year anniversary of the formation of the Northfield People for Peace and Goodwill (PPG). This loosely organized group has held a silent vigil every Saturday at noon on bridge square since then. In addition to vigils on Bridge Square, PPG has hosted movies, lectures, panels, and events surrounding peace and social justice. When war began in Afghanistan, some 500 citizens gathered to protest the war. With students at Carleton College, they held a fundraiser in 2004 for Las Delicias. Now, to celebrate their five year anniversary, the Northfield People for Peace and Goodwill will gather on Monday, September 11, at 6:30 pm, once again on Bridge Square, for a 15 minute candlelight vigil. All are welcome. Click on the picture above for a slideshow of vigils, events, and people of PPG.